One of the coolest features of OS X El Capitan is the ability to extend the capabilities of Photos, Apple’s photo management and editing application. Photos replaced iPhoto when OS X Yosemite was updated to 10.10.4 earlier this year. If you haven’t already migrated to Photos from iPhoto, now’s a great time to experiment. 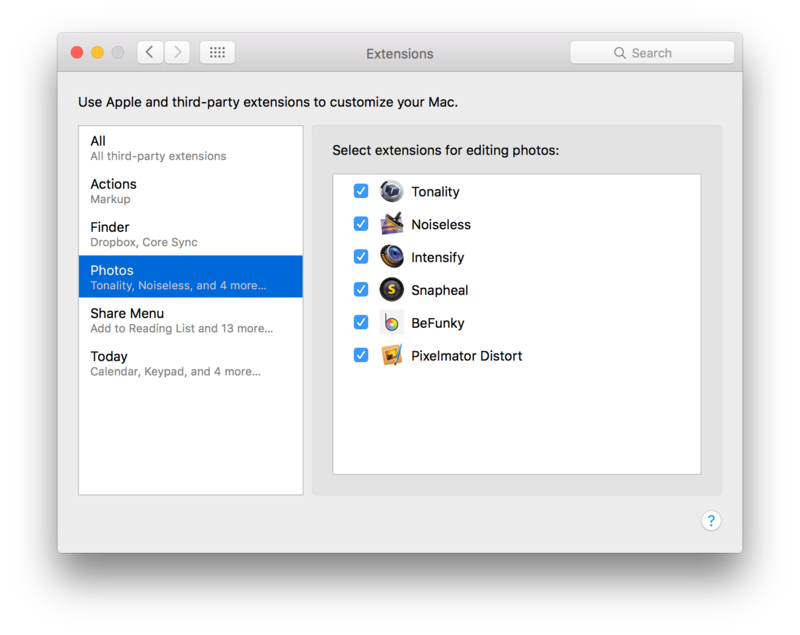 Photos extensions are available from app developers including MacPhun (including Noiseless, Tonality, Intensify and Snapheal), Pixelmator, BeFunky, and soon, Serif Labs (makers of Affinity Photo). Extensions do not provide the same functionality that the full applications do. Unlike Apple’s now-defunct Aperture app, or Adobe Lightroom, Photos does not permit the use of full external editors. What this does is provide some limited functionality so you can edit your photos using tools that are parts of these apps, all without leaving Photos itself. It makes doing color correction, reducing noise and making other editing changes that much easier. Download the latest versions of apps that support them, available from the Mac App Store. Open the Extensions system preference. Click the checkbox next to the name of the extension or extensions you’d like to use. Select the extension you’d like to use. Any extension you checked in the Extensions system preference should be available. Make any changes you’d like, then click the Save Changes button.